31 days. One month. That's how long ago I left home to begin my new job as an Operations Management Associate (in other words, trainee) in Topeka, KS. Sitting here, writing this I can't believe how fast time has flown, how much I have learned, and how much more I still have to learn. The most important thing I have realized is that Kansas is very hot and very, very humid. The first three weeks I was here, I saw temperatures upwards of 100 with heat indexes of over 110. Last week, we got a reprieve with temperatures in the mid-upper 80s, but sure enough, its back to 100-degree days. Yippee! With that in mind, you can say I'm ready for fall. Along with the heat, rain has also been scarce. What started out looking to be a great crop has now quickly changed. Since I arrived, we have had hardly any rain. Just a few scattered showers adding up to only a couple tenths. The corn around here, which was beautiful when I first arrived, is burnt up, and it looks like it’s the end of September. Talking to coworkers, some farmers have already cut their corn; deciding silage was better than the measly yield they would get if they waited. And this is true. 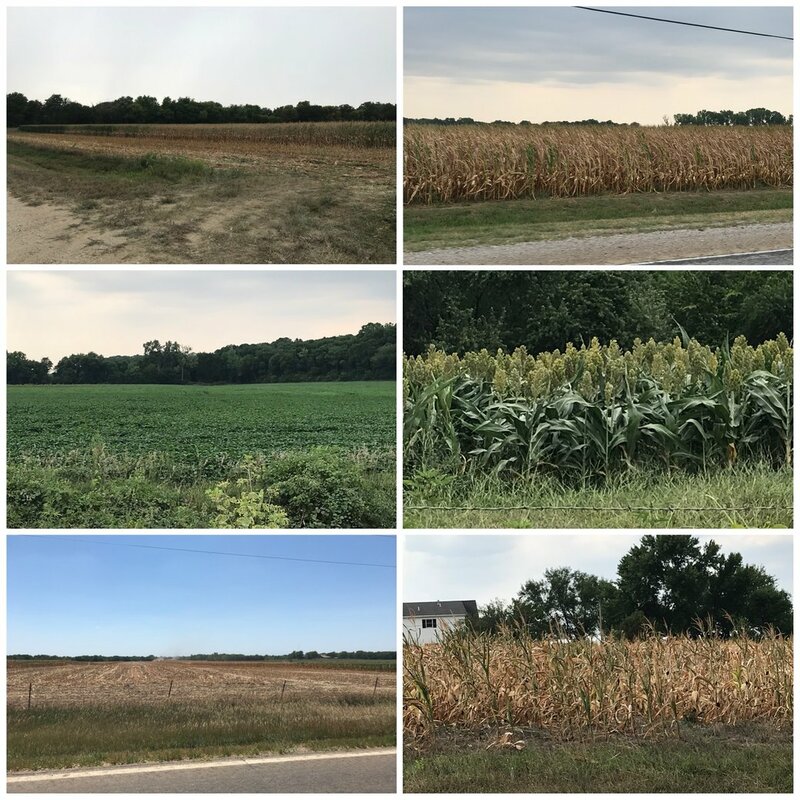 Just two weeks ago, I saw my first field being harvested, and now, it’s becoming more common to see fields of corn stalks. The beans don't seem to show it as bad as the corn, but I have no doubt in my mind the yields are going to be hurting there too. With prices and yields low and the threat of aflatoxin, it’s safe to say we are headed for a rough harvest here in Kansas. Even though harvest is not going to be what it has been in the past, we have been busy in Topeka getting things ready. Cargill has two grain elevators in Topeka (Gordon and Crossroads) and over 30 employees. I primarily work out of the Gordon grain elevator which is an older facility that has around 20 million bu. storage capacity. Crossroads has about 9 million. Corn, beans, hard red wheat, soft red wheat, and milo/sorghum are the commodities that are accepted between both facilities. Corn and beans, however, are the main bread and butter. Both facilities also load out trains and trucks, while Gordon has the capability to unload trains as well. Loading a train, if all goes well, can be done in about 8 hours while unloading takes about 12. Luckily, most of our trains so far have been pool trains meaning we get 48 hours to load, instead of shuttles which mean we only have 15 hours once they are spotted in. Between loading out trains and trucks and getting bins ready (yes, I have gotten in on some bin shoveling), we will be ready for whatever harvest brings in a couple weeks!